10 | November | 2013 | Life, with a click! I couldn’t come up with a decent idea for a picture that didn’t require me having to involve someone else on a Sunday evening for a blog post. I wanted it to involve hands. The deacon’s hands as they pass the sacrament, to capture the comfort that comes the moment a worthy Priesthood holder lays his hands on your head sometimes before the words of the blessing are even started. 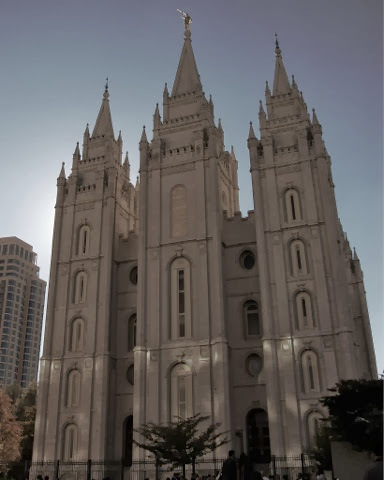 I wasn’t going to bother anyone tonight though so my picture of the SLC temple from October 2012 General Conference wins. My family has been incredibly blessed the past few weeks because of Priesthood blessings. For me asking for a blessing takes a lot if humility and courage. When I’m at that place I am incredibly grateful that there is not a shortage of people I can call on, including phone calls placed to far away Bishops that I’ve never met before. When my life has been turned upside down and I could barely breath I was asked “what can I do to help?” I had no idea, I’m not certain I even knew my name right then but I knew I needed a blessing, perhaps more than I ever had before. The blessing didn’t miraculously change anything, but among a storm of chaos and confusion about everything I thought I knew I was fully aware that my Heavenly Father loves me and knows me — including the trials and difficult times that I face. That is how most of my stories of Priesthood blessings go. No miracles making the warm fuzzy section of the newspaper but many tender mercies that have given me the strength and courage to keep moving forward. For that I am eternally grateful, including those who are so willing to take the time to help when called.